You make money when your clients broadcast their events! LavaView.com is a leading provider of consumer targeted, internet-based pay-per-view broadcasting services. Our customers include more than half a million small business owners and consumers. This means you have an opportunity to grow with one of fasted growing, most organically driven industries. Unlike most ad driven businesses LavaView.com is driven by pay-per-view. 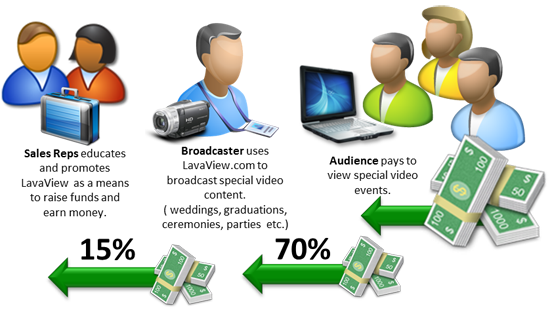 As your clients broadcast their special events, their viewers pay to watch and you earn money. Your clients earn 70% of their ticket fee, you earn 15% and LavaView.com earns 15%. As you can see everyone wins. Our product is easy to promote and sell to just about anyone that needs to use pay-per-view services. Do you see the potential now? Do the math! We have the plans and the tools to reach your target market and earn you money! You can also earn from advertisement sales too!
" The LavaView team has put together a great tool that is easy to sell! " " It is very easy to sell a product when your customer stands to earn money. " " I've added LavaView to my portfolio of services and it has proven to be a winner! " The gross revenue generated is $60,000.00. As a Sales Representative you would earn 15% of the gross totaling $9,000.00 residually. LavaView.com is currently expanding its sales force globally. We are currently seeking direct sales reps, location and promotional managers, and district sales managers. Qualified candidates learn quickly and have a strong initiative. LavaView.com representatives work out of a regional office and/or independently. Top performers can make as much as $250,000 per year. LavaView.com aims to promote internally. A successful salesperson is offered the opportunity to advance into management. A management position offers overrides, residual income, perks, and great benefits. In addition to the exciting financial rewards, LavaView.com also offers monthly contests, incentives, and annual rewards and bonuses. Monthly incentives range in value from $500 to $7000. Finally, we also offer incentive trips to Mexico, the Bahamas, and the Dominican Republic. LavaView.com is ran by Gambrell Software one the most trusted names in the software industry. Since 1997, Gambrell Software has provided software solutions to the likes of BMW, Ford, E*TRADE and many more household names. Honesty and quality are the common threads that drive our customers to love our products. We extend the same honesty and fairness to our sales representatives. Step up, LavaView Can Work for you! LavaView.com provides the most growth opportunity whether you are down on your luck looking for a new start, stay at home mom or a top notch account sales rep. It doesn’t matter; we’ll work with you to be successful at any level. You make money when your client broadcast their event! This is a permanent, lifetime residual offer. As your client base grows you earn money from new clients and existing ones. Sales representatives interact directly with clients. They demonstrate the value of the LavaView.com line of products. The position does not involve telemarketing or passive inside sales. Seasoned sales veterans find our sales approach refreshing. LavaView.com provides all sales tools, presentation materials, and supporting documentation. Third-party support is also offered during the sales interview process. Prospects considering a sales career with LavaView.com are provided with a fast track training program that gets them ready to start selling their first week. The LavaView.com network of support provides sales reps with ongoing training contact with trainers. If you would like to have the best sales position, contact LavaView.com using the online application. One of our representatives will contact you regarding the position and your qualifications.